Please note, there is no substitute for professionally made custom trays. 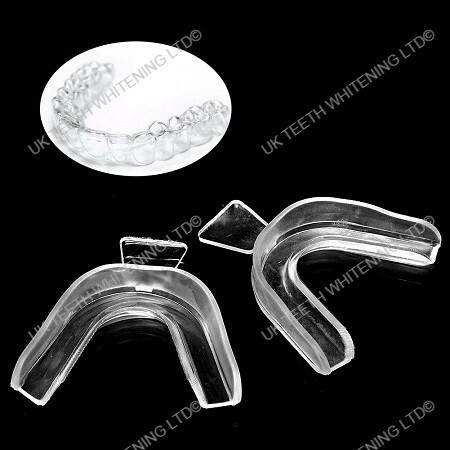 Custom trays are designed to prevent the gel leaking out of the trays and going onto your gums. Our whitening gel products should not come into contact with your gums. If you are unsure please always consult your dentist before using any whitening product. Step 5: Place a small bead of gel per tooth in the inside of the tray. The gel might irritate the gums if the trays are overloaded. Insert the trays very carefully keeping the gel on the teeth and away from the gums. Step 6: Wear the trays for the specified time. If sensitivity or irritation occurs wait 24 hours between treatments and use less gel. Be sure to rinse trays thoroughly after use. Repeat process daily until you reach the desired shade.